Several years ago I worked at the Tower of London. Spending long periods of time within a building of such age, I would often start to wonder about how the area would have looked before the castle was built. Every morning I would pass the remains of Roman walls at Tower Bridge station, walls that were repaired and refortified by King Alfred the Great in response to the very real threat of Viking raids from the river. Blotting out the great hulk of HMS Belfast, Tower Bridge and the modern office blocks that now crowd the banks, I would try to imagine the awe and the terror that a Londoner would have felt a thousand years ago, standing on the city walls, watching the carved and gilded prows of dragon ships silently gliding up the Thames. Viking fleets and armies raided and besieged the city on numerous occasions, and the river has given up dozens of weapons that might have ended up there as a result of those conflicts. Exactly 1000 years ago, in January 1014, people living in England would have been looking to the year ahead with a great deal of uncertainty. A Danish Viking, Svein Forkbeard, sat on the English throne. He had taken it by force only a few weeks previously, having forced the submission of the English nobility and towns. He would die, suddenly, on the 3rd of February. 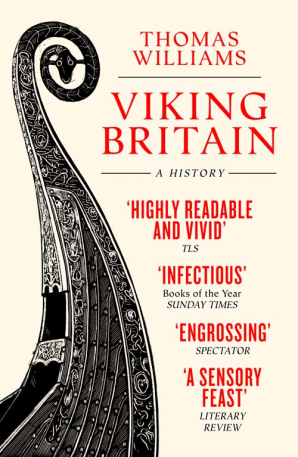 But a fleet of Danish ships still lay menacingly off the English coast, and on board one of those ships was Svein’s son, Cnut, later to rule England as part of the greatest north sea empire the world would ever know. This January, a Danish warship – Roskilde 6 – has returned to England and has taken up residence in the new Sainsbury Exhibitions Gallery at the British Museum, my current place of work. Happily, the dark days of the eleventh century are behind us, and the team from the National Museum of Denmark (NMD) who accompanied the ship to London have not (so far) demanded any tribute or burned any villages. In fact, getting the ship here has been part of a long period of close collaboration between the BM and the NMD (and Berlin State Museums, where Roskilde 6 will head next on its travels). The Danish team of conservators and technicians, led by Kristiane Straetkvern, have been responsible for the conservation and analysis of the surviving timbers of Roskilde 6 (approx. 20% survives of the original ship), and for constructing the extraordinary stainless steel frame in which the timbers are displayed. This is a breathtaking work of modern design in its own right. The frame has been precision engineered in dozens of individual pieces which can be loaded into a single container for shipment and reassembled under the expert handling of the NMD’s installation team. The timbers are packed flat in their own climate controlled container. This evening BBC Scotlandwill be airing the first part of a new series investigating the Bannockburn battlefield. The series is obviously timed to coincide with interest in the battle arising from the Scottish independence debate and coming referendum, but work to precisely locate the site has been ongoing for some time. The series promises to shine a welcome spotlight on a still emerging branch of archaeology and the challenges associated with locating (and protecting) locations that have a powerful resonance in modern political engagement with the past. If the site of Bannockburn can be identified with security (and archaeological proof) then it will join the tiny corpus of pre-Civil War battelfields in Britain that can be identified archaeologically, alongside Bosworth (1485) and Towton (1461). The series is presented by Neil Oliver and Dr. Tony Pollard, director of the Centre for Battlefield Archaeology at Glasgow University. The latter’s involvement should ensure that the series is sensible and insightful, and recalls the days when the pair presented the battlefield archaeology programme Two Men in A Trench before Neil Oliver’s ascent to the dizzy pinnacle of archaeo-presenting megastardom. 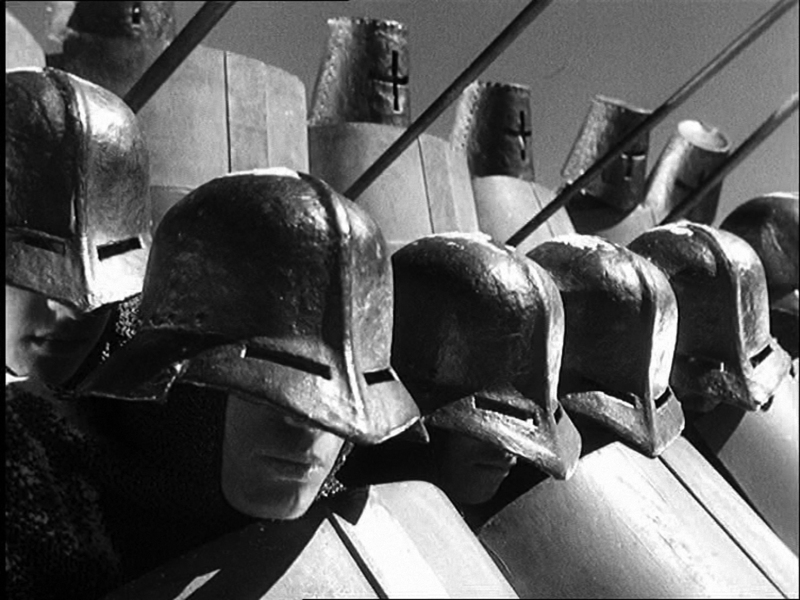 The website has lots of content, and several entertaining clips of people hitting each other with authentic looking fourteenth century hardware. Excellent. I have just recently had another article published in Medieval Warfare magazine, this time – in a bit of a departure from my usual sphere of study – on a battle that took place in the context of the northern crusades that pitched the forces of Catholic western Europe and Scandinavia against the Pagans and Orthodox Christians of the eastern Baltic and beyond. In this case the belligerents comprised the armies of the Russian city states of Novgorod and Pskov (and elsewhere) pitched against a combined army of Danes, Teutonic Knights, Estonians and other crusading forces – perhaps from Germany. The article is triumphantly illustrated by Milek Jakubiec. 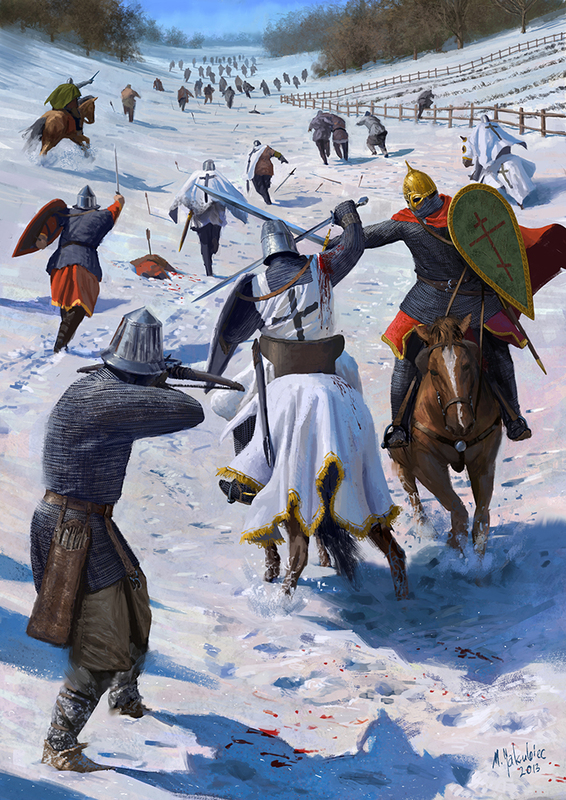 The scene depicts the single combat supposedly fought between the Lithunian-Russian Prince Dovmont (Daumantas) of Pskov, and the Master of the Livonian Branch of the Teutonic Knights, Otto von Lutterberg, during the rout of part of the Catholic army. This may or may not have happened, but it certainly makes for an exciting scene to illustrate the battle. 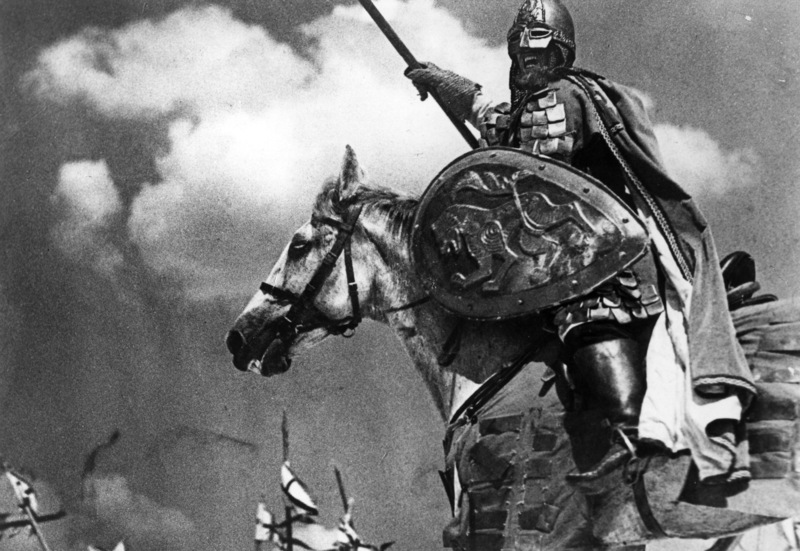 The magazine is full of interesting material relating to the life and times of Alexander Nevsky, prince of Novgorod and hero of Sergei Eisenstein’s epic film that depicted the Teutonic Knights as proto-Nazi invaders. Absolute propagandist bosh of course, but stirring stuff nonetheless!